The park is officially open from Victoria Day weekend in May to Labour Day weekend in September. Park entry fees are not included in daily or weekly site rentals. All vehicles entering the park must purchase and display a pass. The pass must be attached on the upper left hand corner of the vehicle's windshield. There are three different types of individual camping sites available for reservation in the park. 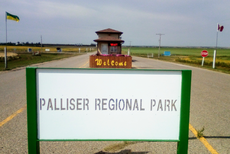 Palliser Regional Park also has four Group Camping sites available for booking. Reservations for the four group camping sites can be made at any point during the year, but the sites are not available for booking on-line - please contact the park office for more information on availability. Group sites include electricity and water. Electrical adapters are available for rent from the entry gate. Upon arrival, group camping fees must be paid in full for the entire stay by the designate. To reserve a group camping site, please complete the Group Camping Reservation Form following and return it to the park office, either via fax, regular mail or e-mail. A $250.00 reservation fee is required at the time of booking for group camping. This reservation fee is non-refundable and will be applied to your group camping fees when you arrive. For information on renting either of these locations for a private function, please contact the park office. To review the rules and policies in effect, please visit the Rules and Regulations page. You may cancel your reservation yourself by logging into the reservation site or by sending an email to the park office at which your reservation was made. These fees can only be refunded to the credit card used in the original transaction. If you cancel at least 14 days before check-in time of the first day of the reservation, you will receive a full refund of your camping fees less a $25.00 Cancellation Fee. If you cancel at least 48 hours prior to check-in time of the first day of your reservation, you will receive 50% refund of your camping fees less a $25.00 Cancellation Fee. If you cancel less than 48 hours prior to your arrival or fail to arrive, your site will be released. You will not receive a refund of your camping fees. You may change your reservation yourself by logging into the reservation site or by sending an email to the park office at which your reservation was made. These fees can only be refunded to the credit card used in the original transaction. If you shorten your stay with at least 14 days notice, you will be refunded the full amount and charged a $10 Change Fee. If you shorten your stay with at least 2 days notice, you will be refunded 75% of your fees and charged a $10 Change Fee. If you change your stay with less than 2 days notice, you will not be refunded.